Lance Armstrong is an American former professional road racing cyclist who fell from glory following a doping scandal. Check out this biography to know about his childhood, life, achievements, works & timeline. Lance Armstrong is an American former professional road racing cyclist who fell from glory following a doping scandal. Once counted amongst the most illustrious and influential athletes of the 21st century, he became the first American to win the Classico San Sebastian and was ranked as the No.1 cyclist in the world, in 1996. Stricken with a potentially fatal metastatic testicular cancer at the height of his career, he fought all odds to defeat the disease and emerged a survivor. He went on to achieve even greater glory after returning to cycling after his cancer scare. From the years 1999 to 2005, Armstrong won seven Tour de France titles consecutively, making his mark in the athletic world. He accomplished much during his glorious career as a cyclist and retired from racing at the end of the 2005 Tour de France. He returned to competitive cycling a few years later, finishing third in the 2009 Tour de France. Considered to be a hero at the time of his retirement for his cycling achievements and courageous battle against cancer, his image went downhill in 2012 after the U.S. Anti-Doping Agency charged him with using performance-enhancing drugs. He was stripped of his seven Tour de France titles and is currently banned from competing in all the cycling events, including the Olympics. Lance Armstrong was born as Lance Edward Gunderson on September 18, 1971, to Linda Gayle and Eddie Charles Gunderson. His parents divorced when Lance was two and his mother remarried Terry Keith Armstrong, a wholesale salesman, who adopted Lance in 1974. He developed an early interest in sports, excelling in both swimming and cycling. As a teenager he competed in triathlons and swimming competitions, and became a professional triathlete when he was 16. 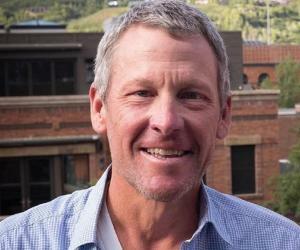 Lance Armstrong turned professional in 1992 with the Motorola Cycling Team. He won 10 one-day events and stage races in 1993 but his crowning glory was the victory in the World Road Race Championship held in Norway. He touched great heights over the next few years, winning the Thrift Drug Classic in 1994, the Clásica de San Sebastián in 1995, and Tour DuPont in 1995 and 1996, among other victories. In 1996, he became the first American to win the La Flèche Wallonne and finished 6th in the time trial in the 1996 Olympic Games. In 1996, the rising sports star was diagnosed with advanced testicular cancer. He underwent extensive treatment and was declared cancer-free in 1997. He returned to his passion, cycling, and made his comeback in 1998 when he finished fourth in the Vuelta a España. In July 1999, Lance Armstrong won the Tour de France, the sport’s most prestigious race, becoming the second American to do so. During this race, allegations of him using drugs first surfaced. He dismissed the allegations and went on to win six more Tour de France until 2005. In 2000, he penned his autobiography ‘It's Not About the Bike: My Journey Back to Life’. The book covers the events in his life from childhood to the 1999 Tour de France and the birth of his first child. A follow-up titled ‘Every Second Counts’ was released in 2003. Armstrong retired from racing in 2005 but returned to competitive racing in 2009, finishing third in the 2009 Tour de France later that year. He retired for a second time in 2011. 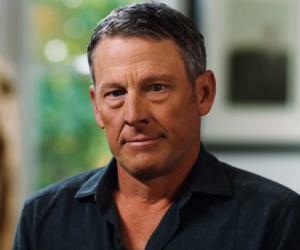 Lance Armstrong had been facing doping allegations ever since winning the 1999 Tour de France. For several years he kept denying the charges. Based on the blood samples from the years 2009 to 2010, Armstrong was charged with using performance-enhancing drugs, by the U.S. Anti-Doping Agency, in June 2012. Armstrong did not contest the charges and received a lifetime ban from competing in all sports that follow the World Anti-Doping Agency code. 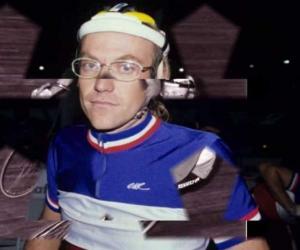 After vehemently denying the allegations for years, he finally admitted in 2013, during a televised interview with Oprah Winfrey, that some of the allegations were true..
Once a celebrated hero, he fell from glory and was stripped of all of his achievements after 1998, including his seven Tour de France titles. He was also stripped off his Olympic Bronze Medal, which he won at the 2000 Sydney Games, by the International Olympic Committee, in 2013. After beating a potentially fatal form of cancer, Armstrong founded the Lance Armstrong Foundation in 1997 for supporting people affected by the disease. The foundation has raised more than $325 million for cancer research. He also founded the ‘LiveStrong’ brand and store in 2004, which raised a large part of the funds for his cancer foundation. Along with other athletes like Andre Agassi, Muhammad Ali, Warrick Dunn, Jeff Gordon, Mia Hamm, and Tony Hawk, he co-founded Athletes for Hope in 2007. The organization helps professional athletes become involved in charitable causes and aims to inspire non-athletes to volunteer and support the community. In 1996, Lance Armstrong was diagnosed with testicular cancer, which had spread to his brain, lungs and abdomen. Given just a 40 percent chance of survival, he consulted expert oncologists and began a grueling treatment regime. He was declared cancer-free in 1997. In 1998, he married Kristin Richard. The couple went on to have three children. Armstrong had banked his sperm prior to his cancer surgery and chemotherapy which made these pregnancies possible. He divorced Kristin in 2003. He was in a relationship with singer Sheryl Crow for a few years, and was even engaged to her briefly. The couple split in 2006. He began dating Anna Hansen in 2008. Initially it was believed that Armstrong could no longer father children due to his cancer treatment, but the couple went on to have two naturally conceived children.